The idea of Barack Obama winning North Carolina or perhaps Indiana, I think we have gotten accustomed to. But Obama winning ... West Virginia, a state where he got barely a quarter of the vote in the Democratic primary? That's what American Research Group says; in fact, it gives Obama a rather large, 8-point lead in the Mountaineer State. I'd have to say that I'm very, very skeptical of this one until I see it confirmed by another polling agency; this is exactly the sort of quirky result that ARG is (in)famous for. Nevertheless, if Obama has a double-digit lead in Pennsylvania -- and all of the polls seem to think that he does -- that means he's had to have made at least some progress in the "Pennsyltucky" region in the interior of the state. And if he's made progress in Pennsyltucky, that probably means he's made progress in West Virginia. West Virginia -- like Pennsylvania -- is also a place where the Democrats retain a substantial edge in party identification, and perhaps the economy has really brought Democrats home. Indeed, for the past week or so, just about every poll taken in a Kerry state has shown Obama with a double-digit lead, with the minor exception of Minnesota, where the polling has been erratic. In any event, there might be some merit in Obama paying a visit to West Virginia -- not because it's quite moved to the point where it's a swing state but because I think the symbolism of all of it would get him a lot of earned media. 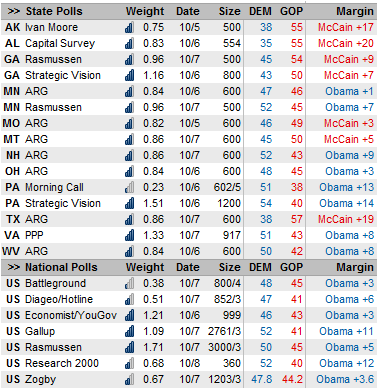 Obama slightly improved his position in the tracking polls today -- incorporating one full day of interviewing after the Nashville debate -- although most of that is the Diageo/Hotline poll having snapped back to Obama +6 after showing him ahead by just 1 yesterday. (You should continue to give top priority the Gallup and Rasmussen tracking polls as their large sample sizes make them less prone to this sort of result). We'll want to wait until the weekend before we can more fully evaluate the effects of the debate.